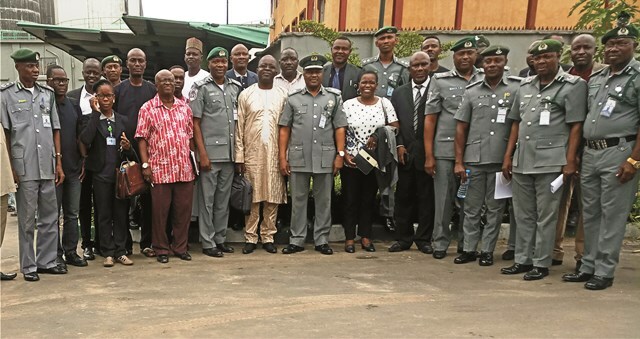 Deputy Commandant, Customs Training School, Abuja, Comptroller Wale Adeniyi (middle), with Senior Technical Officer, World Customs Organisation (WCO), Brussels, Mr Samson Bilangna (5th left), Chief Manager, Kenya Revenue Authority, Mrs Agatha Munyaka(6th right) and other participants, during a workshop on Trade Release Study (TRS) with stakeholders in Apapa Port, Lagos, recently. A renowned stake-holder in the maritime sector in Rivers State has attributed the two most recent boat mishaps that occurred in the state recently to the dumping of debris in the water by residents of the city. The stakeholder, who is also a trained marine engineer condemned the act and called on government to legislate laws against such reckless waste disposal method. The stakeholder, who spoke to The Tide on condition of anonymity called on relevant government agencies like the Nigeria Maritime Administration and Safety Agency (NIMASA) and the Ministry of Transport to clean the river of debris. He admonished companies and residents of the city to desist from polluting the rivers with waste, thereby causing accident. The stakeholder advocated for marine police to patrol the waterways and possibly arrest anyone caught dumping waste into the river. He explained that waste materials dumped in the river damaged the engines of the boats. According to him, debris and other industrial waste in the river pollute the water and also kill the aquatic creatures. On reckless driving by operators, he advised that government should legislate laws on speed limits among boat operators in the state and arrest those indulging in overloading of passengers. Describing night driving as dangerous, the mariner appealed to boat operators to desist from plying at night but limit their operations to 6pm.